The extremely dry and sunny weather impacted heavily on angling conditions during the week. Water levels dropped further and even reached some very critical levels on a number of Moy tributaries. The River Deel in Crossmolina was the worst affected tributary where a section of the river ran completely dry! Nevertheless, there was still some decent salmon angling on the main river and with angling effort increasing, several fisheries reported good catches despite the difficult conditions. The Moy Fishery produced a total of 29 fish for the week including some nice ones between 9 lbs. and 11.5 lbs. from the Cathedral Beat. Anglers on the Weir Pool also did well and there were 5 fish caught on the Ridge Pool. Almost all fish came to the fly. Further upriver on Armstrong's, Gilles Boudier from France had two grilse on bubble & fly, while Swizz angler, Jörg Gasser caught a grilse on prawn on Gannon's. 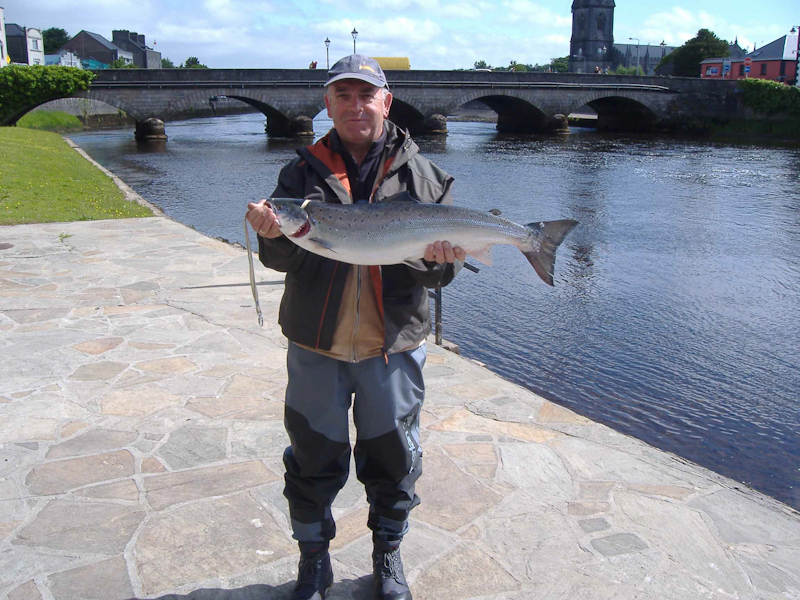 The Foxford Salmon Anglers waters produced 47 fish for the week, while some anglers on the Cloongee Fishery also did well. Most effective methods were spinning and bubble & fly. Patrice Boisadam, France, was particularly successful catching 3 fish on spinner, best at 12.5 lbs.! 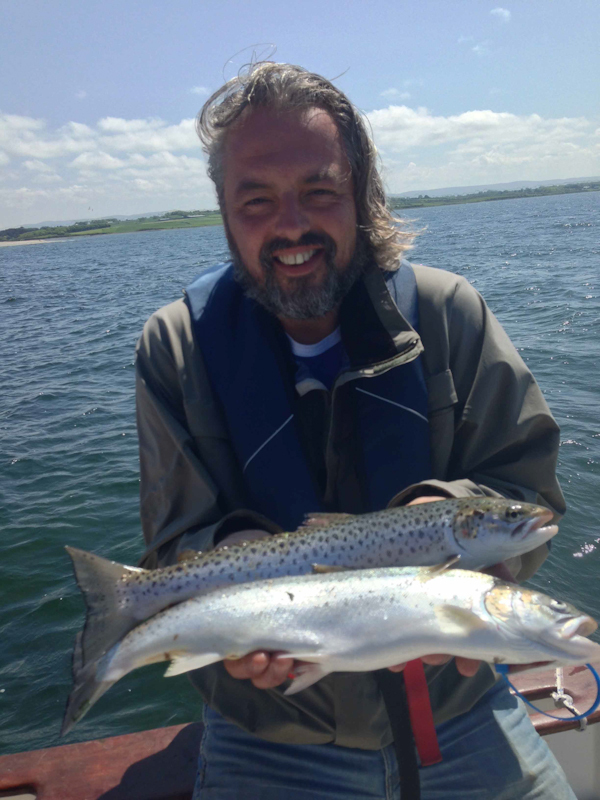 Judd Ruane, skipper of the Pegasus, reported very good sea trout fishing up until last Thursday, while the higher spring tides affected angling over the weekend. Sea trout are caught in good numbers and an average weight of 1.5 lbs. is also quite impressive. Amongst the successful anglers was Dutch visitor, Martin van Seemus who caught a number of good Moy sea trout during his stay. Martin van Seemus shows two fresh run Moy Estuary sea trout on Pegasus. Given the conditions for the week there was very good fishing at Ballisodare with 74 fish caught, 28 of which were released. With the river being so low due to a prolonged dry spell, the fishing mainly took place at the Falls with worm, fly and prawn each taking good numbers of fish. The best fish of the week was a cracker of approximately 12 lbs. which was caught on the prawn and sportingly released. Fish at the moment are averaging between 4 to 5 lbs. with six and seven pounders also being caught. Still a decent number of sizeable fish about but they are proving to be hard caught. Visiting French anglers, Frederick Rollin and Allain Colonvan, had a couple of good days catching 5 between them (several released), skating a small hitched plastic tube fly, a method not often practiced at Ballisodare but one that in these tough conditions will now be used more often! On Monday, Eamon Ruddy had a nice 6 lbs. fish on the worm. Paddy Beirne had 2 nice grilse on Tuesday both on the prawn weighing approx. 5 lbs. each, one was released. On Tuesday Mark Walton had his first ever fish on the prawn (also his first time to try it), a grilse of 4 lbs. The prawn can be a very effective method at the Falls in this dry warm weather! Dermot Glennon also released two (4 lbs. & 6lbs.) on the prawn on the same day. 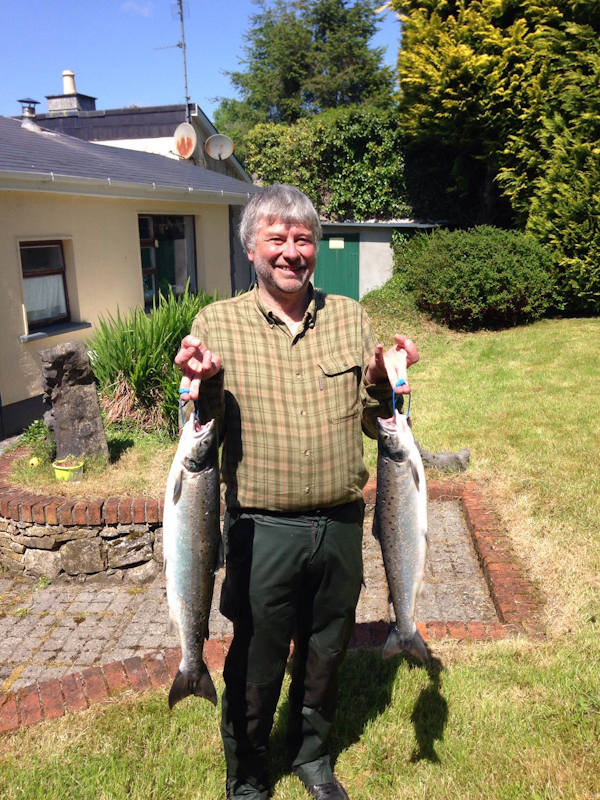 Alan McMaster visited the Ballisodare fishery on Wednesday and went home with two nice 4 lbs. grilse caught on the worm. Visiting party from Dublin, the O'Dwyers, also had a good day: Mark, Frank and Dominic all had fish, mainly on worm but Dominic managed a 4 lbs. grilse on the prawn. Sean Haran had a good fish of 7 lbs on Wednesday also. On Thursday, Jim Fingerton from Dublin landed a lovely sea-liced seven pounder fish on the worm. On Friday, Joan Bowen-Walsh had her first success of the 2016 season and she done it in style, not only catching one, but catching two fish on the worm! David Sheilds done well this day catching two on the fly, one fish was approximately 8 lbs. Father and Son, Vincent and Michael Flynn, fished on Saturday and had four fish between them;, Vincent had three on the fly (one released) weighing 4.4 lbs. and 5 lbs., while Michael had his first of the season, a 4 lbs. grilse on the worm. Other good fish recorded on Saturday were caught by Paul McGrory (7 lbs. on the fly), Albert Berry (6 lbs. also on the fly) and visiting angler, Micheal Hennebery, who had a lovely 9 lbs. fish also on fly. Anthony McCann and Billy McDevitt had the best fish on Sunday weighing 6 lbs. and 7 lbs. respectively; Anthony had his on the prawn, while Billy got his one on the worm. Other fish were caught in the 4 to 5 lbs. bracket on worm, prawn and fly. Despite the dry and sunny conditions and the very low water level, Carrowmore Lake still produced a good few salmon during the past week. While a few fish were caught during daytime, the most productive period seemed to be the evening. Amongst the successful anglers were Cameron Brant, US, with one grilse and South African angler, Wayne Oldfield, who had two fish. 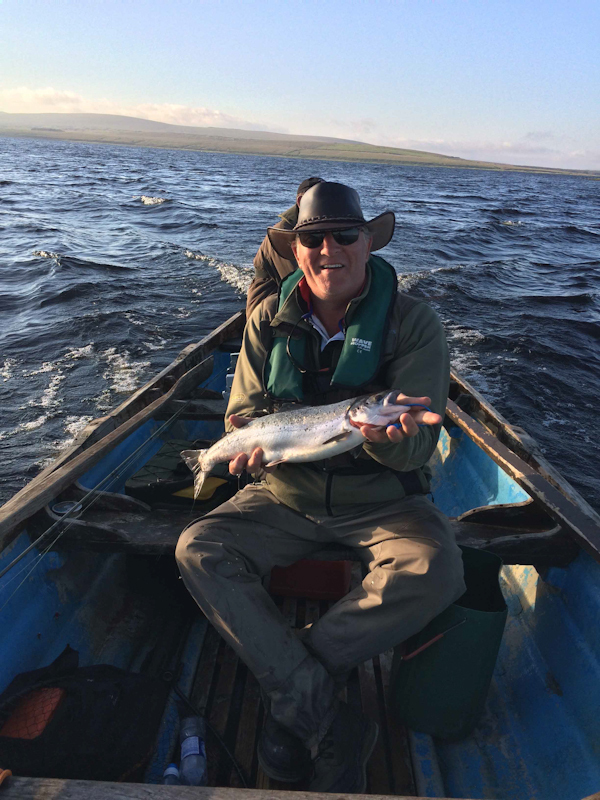 Nigel Williams from the UK was also successful catching his first ever Carrowmore salmon. A happy Nigel Williams, UK, with his first Carrowmore grilse.